Vehicle: 2001 E320 4Matic Wagon named "Weecle"
The other day we got about two inches of snow, hardly unknown in April in Maine. Yesterday I took a routine 5 mile trip, and noticed that water had leaked into the cabin and left a puddle on the Weathertech floor mats. This has happened before with no ill effects, though it is not consistent, and I haven't discovered the source of the leak (suspect door seal, sunroof, or roof rack mounts). When I got home and turned off the car, the parking lights & fog lights stayed on and did not shut off automatically. These usually only remain on if I switch the lights on, which I hadn't. I suspected that water had gotten into the light switch, so my wife & I got out the hair dryer and tried drying it out for a few minutes to no effect. We decided to run the car to warm it up & dry it out. It ran for a while, but when I went out to shut it off it had stopped running and would not even turn over again. So I left it alone. After this, the fog lights went on & off intermittently on their own. Eventually this stopped. I suspect that water somewhere was creating a circuit, and eventually this water dried out and it healed itself. This morning when I tried to start the car, it turned over but would not start. No light problems this time. We've checked all the fuses and they're fine, so that's not the problem. Anybody have any insights into this ghost in the machine? You most likely have a drainage problem with your drain hose from the sunroof drain holes, into your drain hose (which runs down the A pillar) - either a clogged drain hose, or the hose has disconnected from the male drain connection at the sunroof drain, or the hose elbow at the bottom side kick panel (driverside footwell) is clogged or disconnected. This is a common issue. Do a search on the w210 thread as well as the w163 thread for DIY unclogging and remedies (search term - "water in footwell" "sunroof leak" etc). You need to fix this water issue and also need to properly dry out the area under the carpets. These arent just your typical home-style carpets; they are thick and moulded so you need to get under it and in between the moulded carpet with a dryer and towels to get all that trapped water/moisture out. Again do a search on the forums on this - plenty of info and diy info. As for the damp electronics and cranking but no start, scan for saved codes and post. I'd hate to guess at this point. You got the wiring terminal wet which is under the carpet. You need to remove the carpet at the wet side, and look for a terminal strip that the green and brown wire pairs terminate, let it dry, and try again. If it does not work, you need to unplug the connectors and use some electronic connector cleaner and re-plug. Deplore, southpaw and khomer2 like this. Last edited by mrboca; 04-10-2019 at 12:26 PM. When I got the car, the previous owner said that the sunroof leaked and shorted out the motor, so it was disconnected & sealed because repairing it was quoted at $3,000. I've tried opening the sunroof manually with a 4mm hex to no avail, and from what I've read about it here the drains can't be accessed without the sunroof open. You're right that this is probably the underlying problem and the can's been kicked down the road long enough. Thanks. I'll try this tomorrow, when we'll finally have some warm, sunny weather. You could check from the underside (headliner) by opening it up along the edge where it meets the ds handle bar (just above the your head space. see pic. Quite easy to open up but the space is tight and you can check to see if the connection of the drain spout to the hose is intact for water to run thru. I doubt the whatever seal was done, is water tight and your still getting water thru the sunroof. 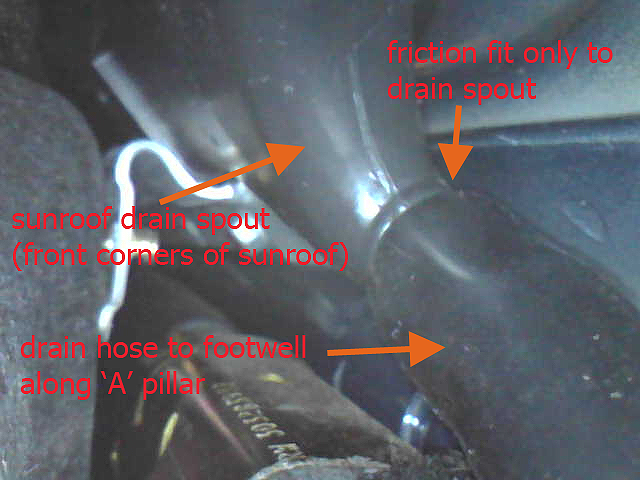 The pic is on my ML and the drain hose had separated from the ds sunroof corner drain spout (due to shrinkage). A large strip of the rubber sunroof gasket has peeled away on the driver's side, which is obviously where the water leaked in. The quick fix will be to cement it back in place. However the sunroof was sealed, it seems to have held up reasonably well until now. I peeled up the carpet and found the wiring boxes along the inside of the door sill edge. They and everything else were wet, but I couldn't figure out how to open the boxes to dry out the terminals. I left it exposed to the sun all day, which got it mostly dry. Other than turning over but not starting, the electrical system appears to be functioning properly. Tomorrow is another day. Spray some electrical contact cleaner onto the boxes, terminals. That will get the moisture out. I'd get a small blow dryer in there, low setting to further dry it out. Just leave it in there blowing for a few hours. I don't have any electrical contact cleaner, and I don't think WD-40 would have the desired effect. My wife has put a container of household desiccant in the car. Her hair dryer is one step removed from a heat gun, and would melt plastic bits without constant attention & care. She suggested spraying air in with the compressor, which at low enough pressure might be the best bet. Thanks for the advice about removing the headliner to access the sunroof drain. I'll give it a try. Dollars to donuts the drain hose has detached at the pressure fitting. According to our auto technician, all sunroofs leak, which is why they have drains. Obviously, the previous owner(s) fixed the symptoms instead of fixing the underlying problem. Unfortunately, I don't have the time to fix the sunroof myself, although I've read repeatedly everything on this forum about sunroof problems and think fixing it is within my abilities given enough time. The best long-term solution is to build a garage. I have met someone who had a leak problem like yours ( from the top of the windshield to the front dome light / sunroof switch). He spent time and money trying to get it repaired. It was fixed for a while, but started leaking again. He ended up getting them to seal the sunroof edges at the top permanently. Of course, the sunroof motor was disconnected permanently..
26306 Attachment(s) Who is ISIS?